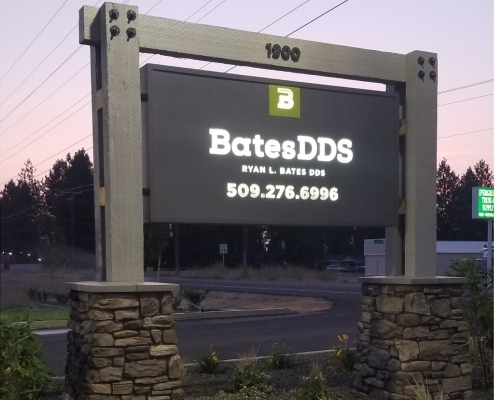 Bates DDS wanted an updated, modern sign that projects the quality of his dental practice. This illuminated sign features a solid background with “push thru” letters. Push thru letters and elements interest to a simple and modern monument sign. “Push thru” signs are signs that have the letters or logo shape routed out and thick acrylic is routed to match. The acrylic is then pushed through the back of the sign and attaches to the sign face. The overall effect is clean design with added depth and dimension. We created the custom illuminated sign with simple design in mind. Beside the black background, the only color is the logo green, and we had to be sure it was perfect. We did color testing until we matched their pantone color exactly. 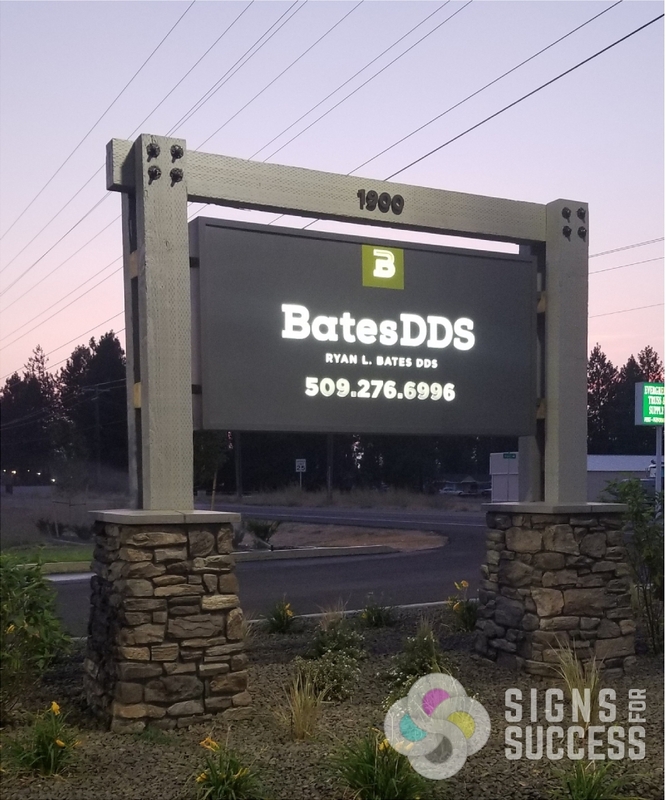 Outdoor signs and monument signs are essential for office and corporate buildings, medical professionals, schools, hospitals, and more. An illuminated sign will not only increase visibility, but also add a certain quality and professionalism to your business front. Whether you have new construction or need to makeover an older monument sign, we will work with your vision and budget to create an eye-catching illuminated sign. Signs for Success is a locally owned family business in Spokane, and we strive for excellent customer service, perfect color, and quick turnaround on every project. Our large production facility allows us to design, print and install everything in-house. Contact us for a free quote on an illuminated sign!